Located just south of Pack Monadnock Mountain, Temple Mountain was home to a regionally popular area for over six decades. The lift served ski origins of Temple Mountain date back to 1937, when Charles Beebe and William Glazier started constructing a ski village in Peterboro Gap. Multiple cabins were constructed, as well as a ski tow. Initial trail names included Earthworm Circuit, Zip, Undertaker's Paradise, and Undertaker's Loop. 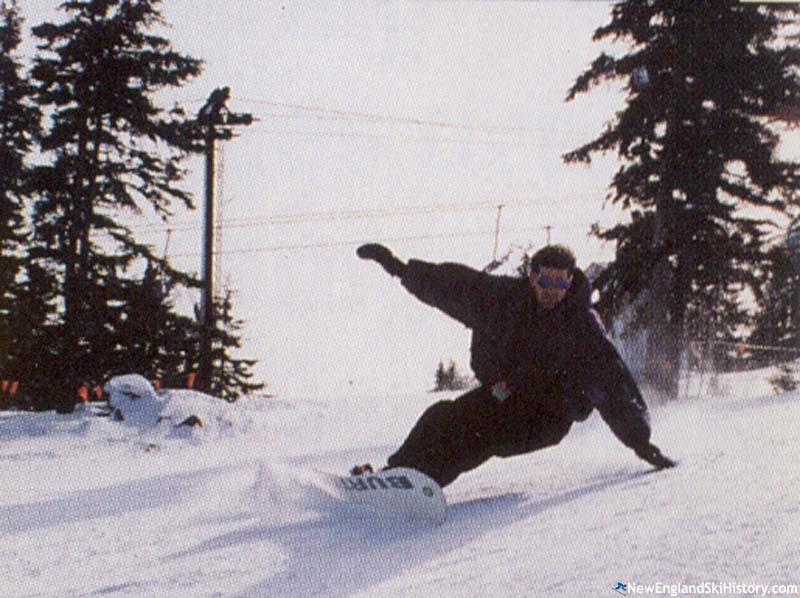 Charles Beebe established Temple Mountain Ski Tow, Inc. in December and the small ski area opened that winter. A second rope tow was likely installed for the 1941-42 season, serving a new novice slope on the north side of the ski area. While many areas shut down due to fuel and labor shortages and restrictions, Temple was able to remain in operation throughout World War II. Temple's third rope tow was likely constructed on a new novice slope near the highway for the 1947-48 season. After operating for over twenty years with rope tows, Temple installed a 1,700 foot long STABIL surface lift for the 1958-59 season. Reaching the upper mountain, the platter lift, along with two rope tows, served six trails. The rare lift's tenure at Temple was short lived, as it was replaced with a modern T-Bar in 1967. A new base lodge was constructed for the 1961-62 season, a fair distance from the parking lot. According to the Boston Globe, owner Charles Beebe stated, "I like it this way...I think a lot of other people do too, too." Temple's first brand new T-Bar was installed for the 1965-66 season, opening up the West Side of the ski area. Unfortunately for Temple, the weather didn't cooperate that winter, with results coming in at 50% below its best season. Charles Beebe's son Mike took over the operation circa 1966, managing the ski area and heading up the ski school. Despite the growth of the facilities, Temple remained a weekend and holidays operation. While other ski areas installed snowmaking in the 1960s and 1970s, the Beebe family did not see it financially feasible to make a significant investment (once telling Ski magazine, "we have snow-making equipment but we never use it." As a result, poor winters hit Temple Mountain particularly hard in the 1970s and early 1980s. 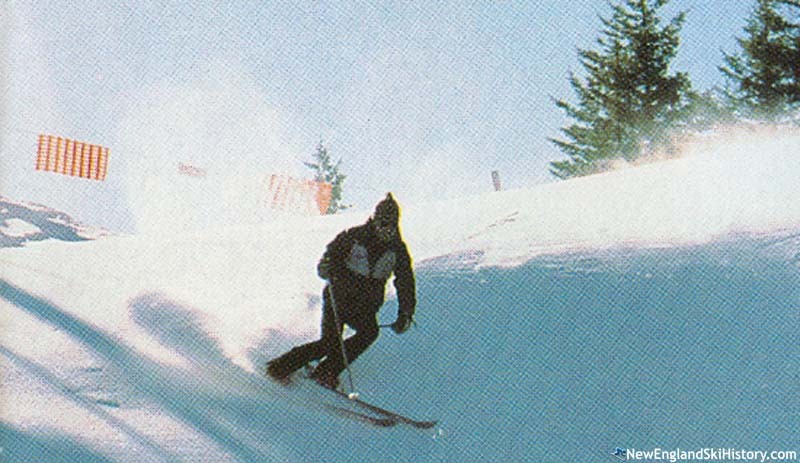 The winter of 1979-80 was especially tough, as the weekend-holidays ski area only operated for about a dozen days starting in mid February. 1980-81 was not much better, as the area only opened for 32 days. As a result, Mike Beebe had to take out $50,000 in Small Business Administration loans to avoid bankruptcy. Peter Martin, Jim Cooper, and Ronald DaSilva's Temple Mountain Ski Corporation purchased the ski area from the Beebe family in April of 1984 and quickly began to make changes. 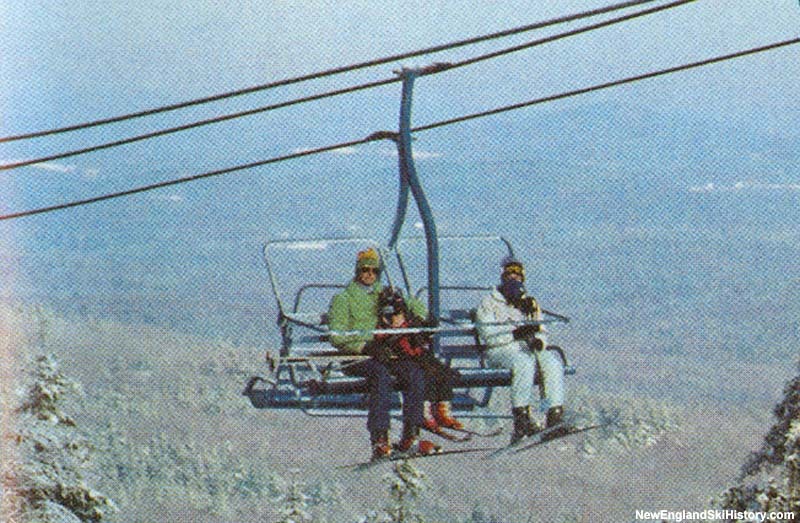 $1.2 million was invested in a wide array of changes for the 1984-85 season, most visible of which was New Hampshire's first quad chairlift. In addition, $90,000 was invested to bring three phase power to the mountain, enabling snowmaking and light to be installed on some 80 percent of the mountain. Finally, the main lodge, trail network, and parking lots were improved, though the base area situation remained awkward. Skiing magazine described the lodge as "marooned among the ski slopes - a short hike, to be sure, but not a comfortable one in street shoes. What the regulars usually do is change to ski boots in the rental shop or in their vehicles, then buy a ticket and ride to the summit before dropping their packs in the lodge for the day." 29 year old local Sandy Eneguess was named General Manager for the new group's first season, which did not get underway until after Christmas due to rain. Shortly thereafter, 250 acres were purchased with the intention of developing an East Side complex, potentially increasing the advertised vertical drop from 600 to 1,100 feet. Meanwhile, the advertised snowmaking capability was increased to 90%. 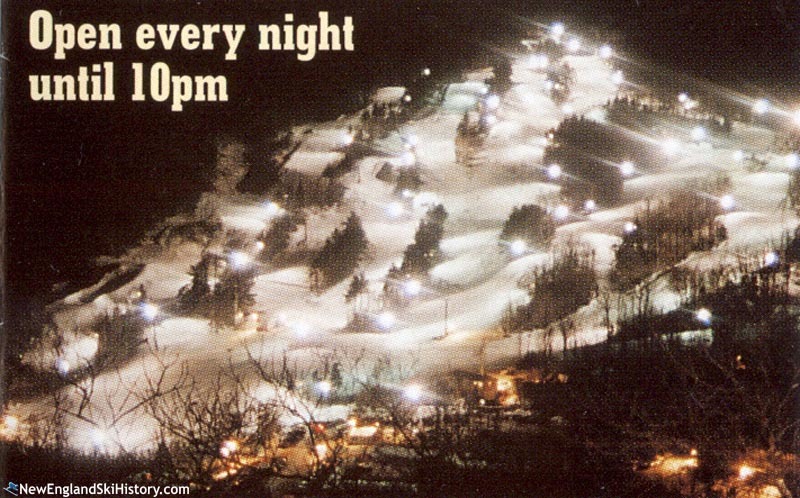 Sandy Eneguess became owner of the ski area in 1988, investing in more snowmaking and lighting. Temple's second chairlift, a used double from Mt. Watatic, MA, and Diamond Hill, RI, was installed to serve lower mountain slopes in 1992. The mountain hit tough times in the late 1990s with mounting debt and 7 years of unpaid property taxes, resulting in bankruptcy in March of 1997. While an effort was made to get the mountain ready for operations that fall, a bankruptcy judge ordered the trustee to cease spending and return pre-paid pass revenue. As a result, Temple sat idle during the winter of 1997-98. After reverting to its previous ownership, the area was able to reopen for the 1998-99 season with Tim Farrell as General Manager. Founder Charles Beebe passed away in February 2000 at the age of 91. Unfortunately, Temple Mountain ski area would not survive much longer. On September 17, 2001, the owners of Temple announced it would not open for the 2001-2002 season, due in part to repairs needed to operate. Instead, the 352 acre property was put up for sale. Peak Resorts considered developing the property but ultimately chose to reopen Crotched Mountain in 2003. John and Connie Kieley of Temple Highlands LLC purchased the ski area in 2003. In 2004, the chairlifts were removed. The quad was sold to Nashoba Valley ski area in Massachusetts, while the double was sold to SkyTrans Manufacturing, LLC. In addition, the base lodge was demolished. 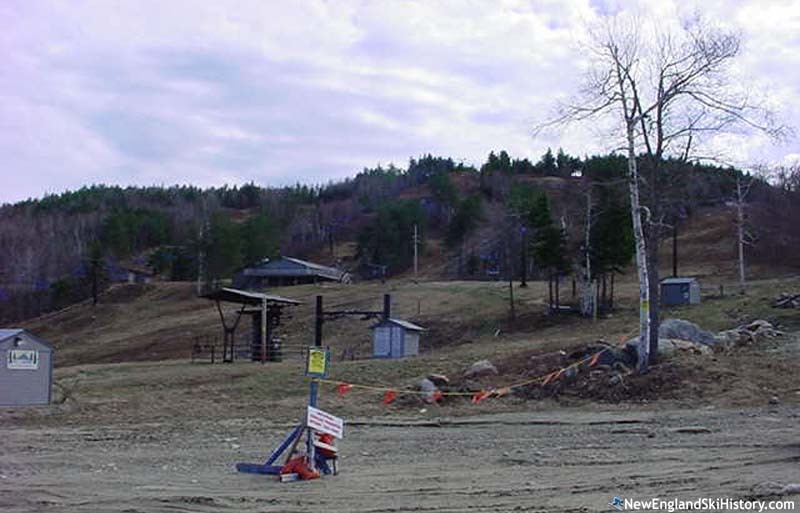 In December 2007 the State of New Hampshire, with some federal funds, purchased the 352 acres from John and Connie Kieley for $1 million after a multi-year effort to dismantle the ski area and preserve the land. Only concrete footings, the occasional pipe or light, and a garage remain. 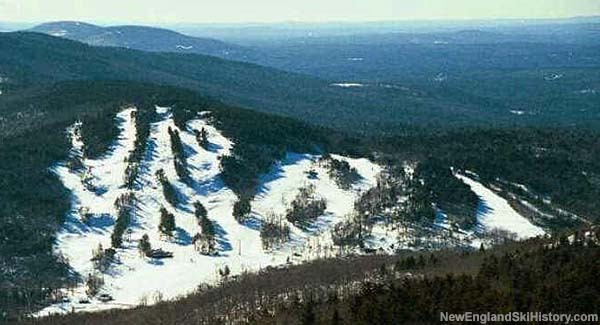 The rapidly revegetating ski area is now part of the Temple Mountain State Reservation. It is highly unlikely to ever reopen for lift served skiing. "I grew up skiing at Temple Mountain thanks to the Pine Hill Waldorf School ski program (1985-1992)- if the mountain was open then Thursdays were half-days and the entire school bussed to Temple at 1100 for skiing the rest of the day. And then every Saturday and Sunday were spent there too. Great memories, great skiing for its size and location. Thanks Temple Mountain!" "I learned to ski at Temple through the Charlotte Ave. elementary school ski program out of Nashua in the 90's. I went for a hike here today and the memories rushed back. I could picture where everything was. I remember my parents coming to watch me ski and having to hike up to the lodge while dodging skiers coming down. Glad it's a conservation area now but too bad it's not still functioning." "I have wonderful memories of Temple Mountain in the late 80's. I worked in the Ski School and for the NASTAR program. The people there were some of the nicest I have ever known; especially Ski Shop owner Johnny Norton." "I worked at Temple mountain in the mid 70's for I think 2 seasons as a lift operator. It is so sad to go through these pages eading about the areas I used to ski at, Crotched, Onset, Indian Head (where I skied hundreds of hours after high school living in Hollis and was ski patrol) Warner Ski hill were I skied for the 1st time at 4 yrs old." "In the eighties I worked as a lift rat at Temple Mountain. I never thought I would have the sad feelings I have after seeing the pictures of the mountain. Those are also pictures of my past. I can only hope that the mountain never gets developed. I'll be hiking around up there this year. " "I'm a relative to the Beebe family (I believe) and looking for more info. on the Beebe history with Temple Mt and the Peterborough area"
"In 1953 My father purchased a 4 acre lot on the West side of the ski area from Charlie and Lucy Beebe and we built a camp with a great view of Mt Monadnock. Our family all skied, and to access the camp in the winter my brother and I cut a rudimentary trail from the Wapack Trail, which was the westernmost ski trail at that time, toward our camp and then looped back toward the base of the Wapack Trail. Charlie Beebe named it Taggart Trail. The property is now owned by my other son John Taggart since 1992, but the camp has collapsed under snow loads. The Beebe's were good friends with our family and we spent time together other than the ski area. He used his tractor to help haul some of our camp material up 1800 feet from the highway. A lot of it went up the hill on my brother's and my shoulders.When the ski area expanded to the West Area lifts and they put in Spruce, Birch, and Broadway it wiped out the Wapack ski trail and Taggart trail, but the Wapack hiking trail still went through that area. The expansion also wiped out one of the best high bush blueberries anywhere. One could get a gallon of berries just from that one bush.All three of our children did a lot skiing there. We even took a grandson there in about 1996. One of their fun events was the Easter Parade. I used to have a slalom flag with Temple Mt stenciled on it, but has probably rotted by now."